On August 13, 2011, Volunteer for Bangladesh (VBD), the volunteer wing of JAAGO Foundation, observed the Great Kindness Challenge for the second time in the country's history. On the day, the underprivileged students of the JAAGO School and the volunteers of VBD joined hands to show their appreciation for the police force of Dhaka and Chittagong. The volunteers and kids divided into various teams and visited almost every police station in the capital and the port city wearing the official VBD t-shirts. They visited the police stations of Gulshan, Tejgaon and Ramna, as well as the offices of the Dhaka Police Commisioner and the Inspector General. 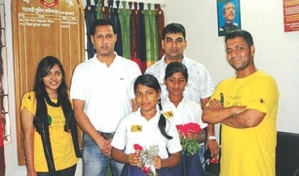 The teams presented the officers with roses and greeting cards prepared by the JAAGO kids and a letter of appreciation from the President of Volunteer for Bangladesh and Founder of JAAGO Foundation, Korvi Rakshand. The letter compassionately thanked the Police Department of Bangladesh for its tremendous effort in ensuring safety and upholding the law and urged the force to utilize its full potential to make Bangladesh an even better place to live in. The volunteers were unable to meet the Inspector General, but when the Additional Inspector General heard about the program, he came out to greet the volunteers personally. He went on to state how happy he was with the initiative. Another officer from the office stated, "It is true that there are a number of inadequacies on our part, but after seeing such an initiative from the young people of our country we are only motivated to try harder to fulfill our duties and serve the nation better." An officer of the Kalabagan Thana mentioned how he had faced with a lot of criticism in his life and how few people bothered to express their gratitude. An officer working at the Dhanmondi Lake not only praised the initiative but also took pictures of the volunteers and kids, to always remember them and to share this with their friends and family.